Input text: the ground is moon. the sky is black. the [city] wall is 5 feet north of a movie camera. The movie camera is facing north. the wall is 7 feet high. the wall is 8 feet wide. the movie camera is 2 feet tall. the [grass] carpet is 2 feet north of the movie camera. a crane is 1 foot west of the movie camera. the crane is 8 feet tall. the crane is facing east. a ufo is 2 inches west of the movie camera. the ufo is 3 feet wide. the ufo is 3 feet long. the ufo is 3 feet off the ground. a 2 foot tall alien is on the carpet. another 2 foot tall alien is 5 inches west of the alien. 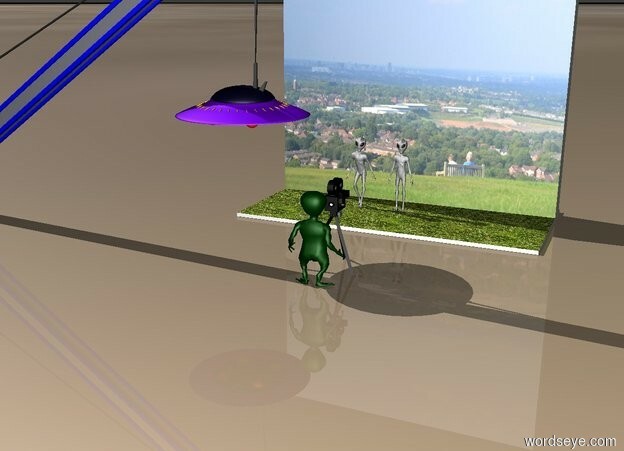 a small alien is 5 inches south of the movie camera. the small alien is facing north. the small alien is 2 feet tall. excellent! My grandfather never believed we landed on the moon.